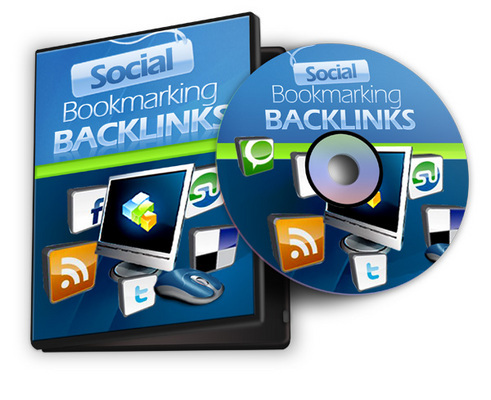 * The Social Bookmarking Backlinks program has been specially created to address the issues above. * We're all fed up of getting sand pitted and struggling to get higher rankings in the search engines. * This twelve part video course will walk you through the entire process of using social bookmarks to massively improve your business. By the time you've finished watching it you will know the most effective ways to use social bookmarking on your websites. You will know exactly what to bookmark and what not to bookmark plus where the best places to bookmark your pages are. This guide will reveal everything you need to know about generating backlinks from social bookmarking. Many people tell you to bookmark your webpages and may even show you one or two places to actually do the bookmarking, but no one will show you everything that is contained in this program. Social bookmarking isn't a complex subject, but to be used properly it needs to be understood. Few marketers discuss social bookmarking beyond the "you must do it" stage. The Social Bookmarking Backlinks program will reveal in step by step format this closely guarded information to help you massively increase your profits. * Video 1 - Introduction - 4m 49s - Learn what is in this step by step training program. Understand what social bookmarks are and why they are so important for you. * Video 2 - Effective Social Bookmarking - 8m 32s - Learn what it takes to effectively use social bookmarking. Discover how you can ensure your bookmarks all stick and are accepted. * Video 3 - What To Bookmark - 4m 43s - Learn what does well in the social bookmarking sites and what doesn't. Discover the best types of pages to bookmark for maximum effectiveness. * Video 4 - Free Social Bookmarking Tool - 7m 28s - Discover a powerful tool that will submit your pages automatically to over 30 social bookmarking sites at a click of a button. * Video 5 - Cheap Bookmarks - 10m 25s - Learn one of the best places to get natural social bookmarks for one or two cents a bookmark! * Video 6 - Outsourcing - 11m 06s - Learn how to outsource your social bookmarking. Discover some top places to find outsourcers at incredibly reasonable prices. Know what to give your outsourcer in order for you to get maximum benefit from their work. * Video 7 - Social Bookmarking Tools - 11m 22s - See some of the top social bookmarking tools and determine which one will help your business. Understand what you need to know before you spend your money on buying software tools. * Video 8 - Automated Social Bookmarking - 3m 43s - See a free way that takes 15 - 20 minutes and gets you 50 social. bookmarking buttons! * Video 9 - Major Social Bookmarking Sites - 7m 48s - See some of the major social bookmarking sites up close and personal. Discover what these sites and looking for and how giving it to them can get you thousands of visitors a day. * Video 10 - Adding Social Bookmarking Buttons - 7m 10s - Learn how to rapidly add social bookmarking buttons to your website so your visitors can bookmark your pages. Discover the biggest mistake many people make when adding social bookmarking buttons. * Video 11 - Creating Your Own Bookmarking Site - 3m 40s - Learn how to create your own social bookmarking site. And how this could be very beneficial to you. * Video 12 - Summary - 7m 26s - Summarize all the information you have learned. Discover how to take this forward to the next level and start really benefiting from social bookmarking. * Notable Reseller Extras - Audio version, eBook, MS PowerPoint version, Video transcript, Wordpress Theme, and more.